Currently, USTA Player Development is partnered with five Regional Training Center (RTC) programs across the country. Now more than ever, the very best coaching and instruction the USTA has to offer can be found closer to home. USTA National Campus - Orlando, Fla. The USTA National Campus is a 100-plus-court, state-of-the-art facility serving as the touchstone for tennis in the United State is built over 63 acres of land in Orlando, Fla.
USTA Training Center East - Flushing, N.Y. 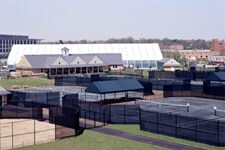 The USTA Training Center - East is located at the USTA Billie Jean King National Tennis Center (NTC) in Flushing, N.Y., one of the largest public tennis facilities in the world. Operated by the USTA for the city of New York, the facility opened in 1978 when the USTA moved the US Open from the West Side Tennis Club in nearby Forest Hills. The USTA Training Center - West is located at the StubHub Center in Carson, Calif. The StubHub Center is a 125-acre development featuring state-of-the-art stadiums and facilities for soccer, tennis, track & field, cycling, lacrosse, rugby, volleyball, baseball, softball, basketball and other sports.